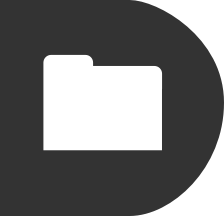 It adds a checkbox that speeds up Time Machine backups, something that’s really helpful if you only plug in your backup drive occasionally, resulting in Time Machine needing to copy lots of data. Time Machine is normally set up with a very low I/O priority, which means that macOS puts it at the back of the queue for disk access. This keeps it from interfering with anything else on your machine, but means that it copies data very slowly. 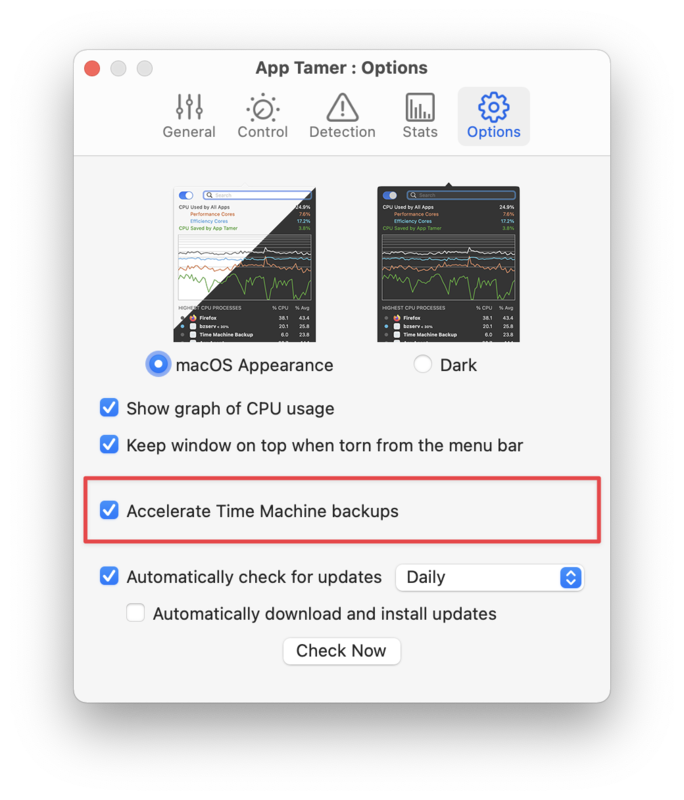 Mac Kung Fu published an article last year detailing a geeky way to speed Time Machine up, but it requires a Terminal command and only stays in force until the next time you reboot your Mac. App Tamer now offers a checkbox in the prefs to take care of this for you, and will re-apply the setting whenever it’s running. There are some caveats about this method, however. Because it prevents macOS from throttling processes that have low I/O priority, it can potentially cause other processes that are supposed to be slowly doing disk or network I/O in the background to run faster. This may not be what you want in some instances. It could cause those processes to consume more battery power, for instance, than they would otherwise – so keep an eye out if you turn this option on. We haven’t seen any negative effects from the Time Machine acceleration, but there may be instances where it burns your laptop battery faster. App Tamer 2.3.3 also lets you change the priority of processes – the equivalent of the unix renice command. It’s not nearly as effective of a way to control CPU usage as App Tamer’s methods, but can be useful in some circumstances. 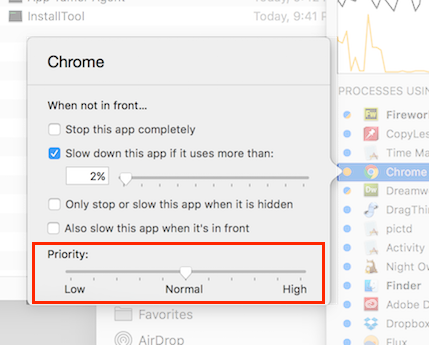 Hold down the Option key while clicking on a process in App Tamer in order to get a Priority slider alongside App Tamer’s normal slow/stop options.